"This is a recipe for yogurt lovers! 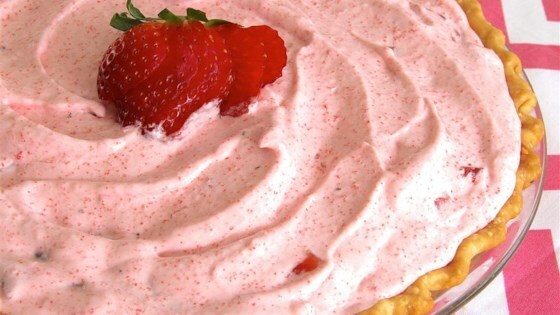 Creamy strawberry yogurt and fluffy whipped topping surround chunks of juicy strawberries in this refreshing pie. " I followed the recipe exectly, and the pie did not get firm for me. I ended up freezing it and it came out very good. This pie is so quick and easy and really delicious. I made it for a Luau Party substituting pineapple yogurt, frozen pineapple, and pineapple Jell-O gelatin for extra flavor. It was a big hit! I haved made this pie in the past, and it is a wonderful display of sweet and a touch of tang to your pallet. A wonderful addition to any meal.